Sachin Ramesh Tendulkar scores his 100th ton in book cricket (Satire) | Make Time For Sports. The 16th of April, 2011 will remain a red letter day for Sachin Ramesh Tendulkar. It is the day he scored his 100th international century in book cricket. The master batsman believes that this is a good omen. 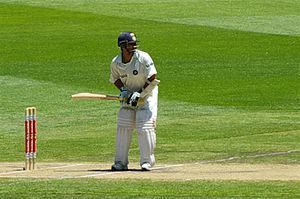 All his tons in international cricket have been preceded by equivalent tons in book cricket. “Book cricket is a sport I have indulged in since I was a little boy.” says the Little Master. Another cricketer who enjoys book cricket is Virender Sehwag. The master batsman believes that it is just a matter of time before he scores a triple in book cricket and subsequently Test cricket. Tendulkar will be posting the rules of the game on his web-site.